The Rabbi with a Blog (Rabbi Jason Miller): Is Your Donkey Equipped with Wi-Fi? Is Your Donkey Equipped with Wi-Fi? Back in December 2004, I wrote about my technology experience at the Mamshit Camel Ranch, a Bedouin village in Israel. I explained how funny it was to be at a Bedouin village that appeared to be authentically rustic to the Birthright Israel participants I was chaperoning, but behind-the-scenes the place was equipped with the latest technology. It was odd to be sitting in a Bedouin tent and checking my email and posting to my blog as camels and donkeys walked around outside. 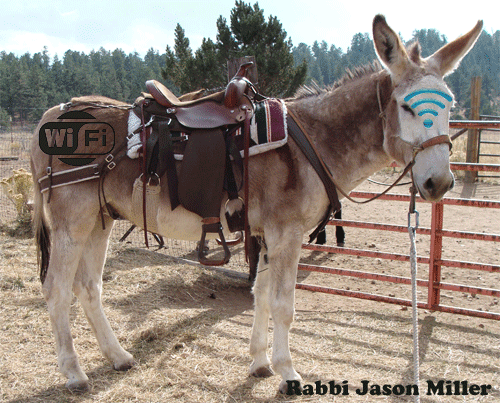 I was reminded of that experience today after I read that Kfar Kedem in Israel will be equipping their donkeys with Wi-Fi. In an article humorously titled "Internet for those who won’t get off their asses," The Times of Israel reports that "the northern town of Hoshaya [Israel] is planning on installing WiFi Internet access on the donkeys it uses as part of its Talmudic-era amusement village, Kfar Kedem." The amusement park, which is sort of like Colonial Williamsburg in Virginia or Greenfield Village outside of Detroit, offers visitors a reenactment of Judean life in the Galilee from the 1st and 2nd centuries. Apparently, Kfar Kedem's director, Menachem Goldberg, felt it was time to offer wireless Internet access on the donkeys so his visitors could post photos while they're still riding the donkeys. I'm not certain if Facebook and Foursquare will be able to identify precisely which donkey one is sitting on with GPS tracking technology, but that capability probably isn't far behind. At least no tourist to Israel will have trouble checking their email while they're donkey riding anymore. Maybe it should be advertised as E-Mule Access. Cross-posted to the Jewish Techs blog at The Jewish Week.